Japanese farmers are husking (in the front) and winnowing rice (in the back). The mill in the front is called a dozurusu (土摺臼), and the winnowing machine in the back is a toumi (唐箕). 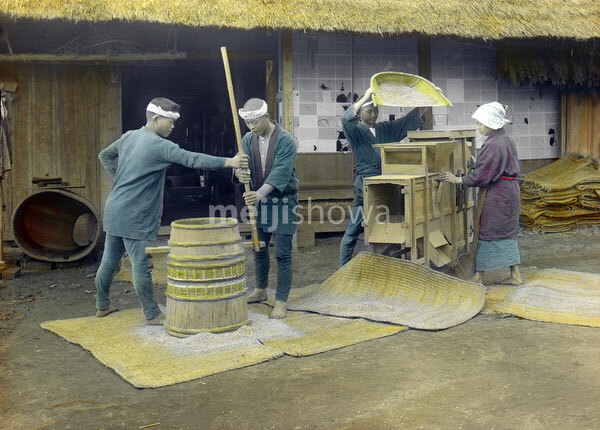 The process of separating the grain from the chaff was called fusen (風選), and involved one person feeding the toumi with grain, while another turned the fan. The wind did the rest. The machine could be adjusted to increase effectiveness. Invented in China in the beginning of the Christian Era, the toumi was used in Japan extensively. Strangely, it reached Europe only in the 18th century.